A fantastic addition to our large selection of wardrobes. 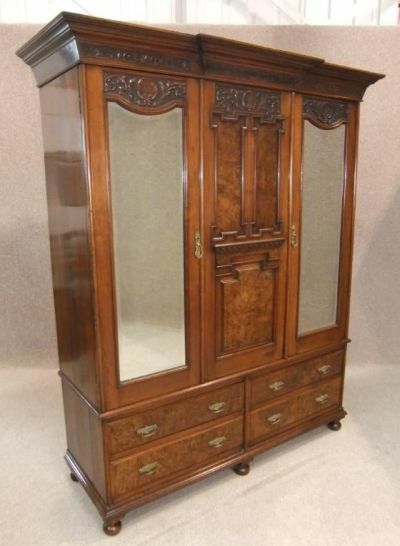 This magnificent walnut late Victorian art nouveau wardrobe features a beautiful carving to the cornice, and centre decorative panel which is flanked by two glazed mirror doors. This stand upon a stylish four drawer base with turned feet. The wardrobe is in beautiful condition for its age, circa 1890, and still retains all of its original quality brass fixings. It breaks down into five individual sections for ease of transportation and reassembly, and would grace any period bedroom setting, or to complement any existing furniture. The condition of this Art nouveau wardrobe is excellent for its age. There is a small expansion gap to one side which is common on pieces of furniture of this age, however, this does not affect the overall beauty of this piece.